Water covers more than two-thirds of the Earth’s surface, but what would happen if you collected all of it one place? 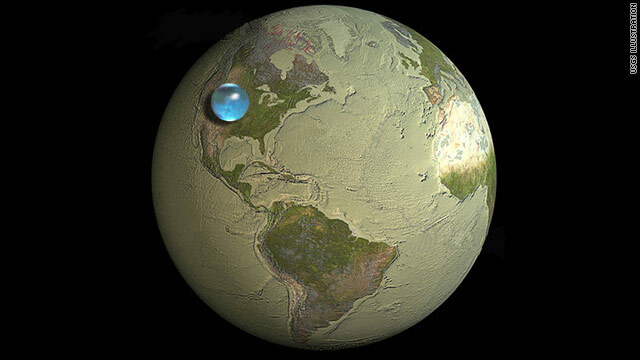 The illustration above, from the United States Geological Survey, shows the size of a sphere needed to hold all of our planet’s water compared to the size of Earth itself. The sphere, which is about 860 miles in diameter and 1.39 million cubic kilometers, is about 1/1000 the size of Earth (or 1/20 the size of the moon). More than 95% of the water sphere comes from world’s oceans, with the remainder made up of water from all other sources including lakes, rivers, and ice caps –- even the water found in plants and animals, according to the USGS. How could they know this? I think that would be interesting to find out. This report is shocking to me. For some reason I always that there was more water than this. It kind of gives to meaning to how the water got here. It's not really that much water compared to Earth so I guess it seems plausible that Earth steamed it out.